← Hard At Work? So Is Your Back! 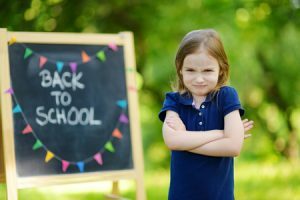 The kids have been back a few weeks now and I thought I should write a blog on children’s posture, as research1 has found over a third (33%) of parents say that their child has suffered from back or neck pain in the past. How often do you see children with their bags overfilled, the wrong type of bag, or a rucksack incorrectly adjusted for the child? Combine that with the good old slouch and this can spell trouble in the form of back or neck pain. You may find some of this advice on bags also carries over to students, as well as school children, and also into the workplace, as many of us are now opting for a rucksack over a briefcase. So you may also benefit from this advice. 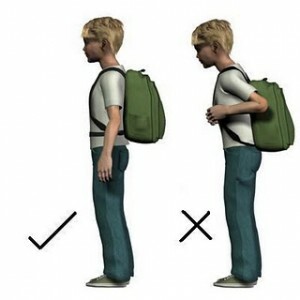 Rucksacks or backpacks seem to be the most sensible option to carry their schoolbooks and pencil cases, but if they’re not carrying them correctly, this could still cause back problems. Carrying a single strapped bag could place too much stress onto one shoulder, potentially causing long-term discomfort in the back or spasms in the neck. In my opinion its worth investing in a school bag that reduces pressure on your child’s back when they’re carrying it. Look out for bags which can be carried on both shoulders, with adjustable straps which will hold the contents close to their back and distribute weight evenly. Padded straps may help those straps from digging into their shoulders. If your child insists on carrying a bag with one strap, encourage them to alternate which shoulder they carry it on and to carry it across their body. Whilst back pain can be caused by a number of different factors, overloaded school bags are a common trigger. When you consider a child’s school bag not only contains books but also a lunchbox, sports gear, including trainers, and mobile phones, this can become a considerable weight. Try spending just a few minutes every evening helping your child pack their school bag. Use this time to ensure that your child is not packing unnecessary items for their day’s activities and to ensure that any weight is equally distributed in their school bag to reduce pressure on their back and neck. A top tip is to ensure that the heavier items are at the top not the bottom of the bag otherwise the rucksack can pull shoulders backwards creating discomfort and more imbalance. Try to keep pointed items or awkward shapes away from the surface of the rucksack that is on the child’s back, as you want the rucksack to sit evenly on their backs. If the backpack is still too heavy, talk with your child’s teacher. It might be possible to leave the heaviest books at school, perhaps in a locker, and bring home only lighter handout materials or work books. Please feel free to take advantage of our free 10 minute spinal check here at Shrewsbury Chiropractic Clinic, to discuss this topic or indeed if your child has a neck or back problem on (01743) 231600.